Chartering a boat, be it a luxury yacht or a motorboat, means you have a suitable boat at your disposal for a limited period of time, without all the worries of ownership. Naturally there are as many kinds of charters as there are kinds of boats present on the market, from small boats for coastal trips to super-yachts, suitable for challenging cruises to be enjoyed in comfort and luxury. 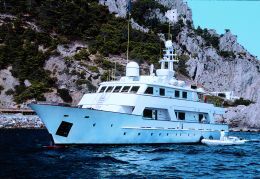 This time let's look at charters designed for those clients who intend to have at their disposal a boat offering on board hospitality like that of a travelling luxury hotel, that is in other words what is on offer in the range of super-yachts equipped with every comfort and a highly qualified crew. In this specific segment the choice sees a predominance of engine driven boats, from classic ships with displacing hulls to the large motor yachts with planing hulls; sailing boats on the other hand, due to the scarcity of boats available and the limited request, remains a fairly small niche market. 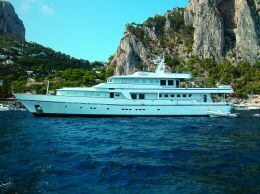 A super-yacht can also be chartered for purposes other than holidays, for example, for a while now on the C“te d'Azur agencies have been offering boats to meet requests for an appropriate setting for events such as conferences and formal encounters. This activity allows to overcome the limits posed by the hotel structures existing in the location of the proposed event offering surroundings and services that fulfil the expectations of both the organisers and the guests. To better understand this phenomenon, we turned to the competence of Mrs. Loredana Zichichi, owner of Rigo Yachts International, a charter agency specialised in super yachts charting all over the world, with head office in via Pindaro 50/9; 00125 Rome (Italy); tel. 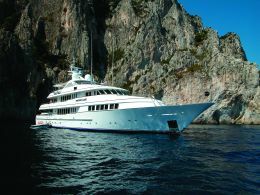 +39 06 5090222; fax +39 06 50917530; website www.rigoyachts.com; e-mail rigoyachts@tin.it. Mrs. Zichichi, can you tell us if over the past few years this tendency to charter luxury boats has undergone any changes? Over the past few years chartering has definitely benefited from a general growth in the boating sector. Bear in mind that as far as regards the offer of important boats, in the past we had at our disposal almost exclusively boats from English owners. For them the yacht is a bit like a hotel and therefore the idea of it being used by someone else does not bother them at all. An Italian owner, for example, has always seen his boat as a second home and the idea that others might use it has always led them to reject the hypothesis of chartering. Recently we have seen an inversion in tendency by those owners who previously would never have considered putting their boat on the market; this circumstance has increased the number of boats up for charter and consequently the market is growing, at least as far as our country is concerned. Can you tell us about super-yacht charters for professional reasons? For many years luxury boats have been chartered for events and formal encounters, above all on the C“te d'Azur, where there are more suitable sized yachts available, with rooms big enough for press conferences or conventions. This choice enables shortcomings in hotels to be compensated for, ensuring a very important return in terms of image. 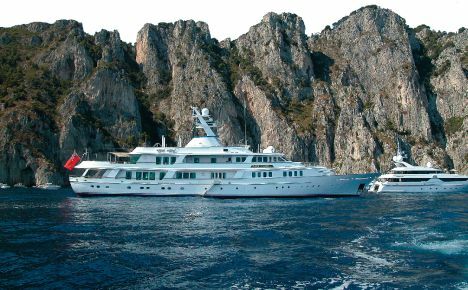 In Italy not many events are held on board super-yachts, but this is mainly due to a shortage of suitable boats. What boats are requested the most for luxury chartering? In this case, we must differentiate between those who charter a boat for a limited period of time, mainly for brief, high speed trips and those who, on the other hand, intend to cruise for a much longer period of time, involving great distances between one port of call and another. In the first instance, a fast motor yacht with planing hull is fine, in the second case they usually require a classic ship with displacing hull. Despite the target of this specific sector, one of the elements considered by the client when choosing the boat is consumption, as well naturally as comfort during sailing and the service that we can offer on board. The crew is a fundamental element for complete, quality service, a good crew must be able to offer something extra, good cuisine for example, the ability to keep the yacht tidy without disturbing the privacy of the guests, in other words, it must be personnel on a level with the situation. Consider that the more crew members there are and the better prepared they are, the higher the standard of service. As far as the boat is concerned, it must be in impeccable condition under every aspect, complete with accessories dedicated to leisure time such as top quality audio video systems, high class tableware and furnishings, with maybe a few nice touches, for example lamps for a formal dinner and other furnishing accessories that manage to make each single area on the yacht particularly welcoming. To finish, can you tell us what the most requested destinations are in the Mediterranean? Our boats go all over. For example, the Americans who come to us and who represent without doubt an important part of our clientele, have as basic stops the Smeralda Coast, the Amalfi Coast, the C“te d'Azur, the Balearic Islands and recently we have had an increase in requests for the Aeolian Islands and Croatia.